Across thousands of miles they journey, converging at a stretch of sandy beach just north of San Simeon mammoth marine mammals and the humans who flock to watch them. Directing this meeting for the benefit of all are the blue-jacketed volunteers from the Friends of the Elephant Seal. 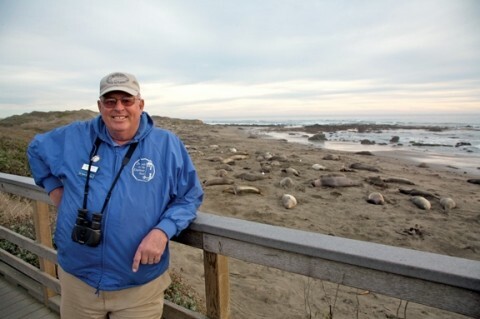 BEACH HEADS : George Larson is one of many docents who put elephant seals in perspective for visitors from around the world. # It's now the busiest time of the year for the elephant seals and their friends. The beach is packed with furry gray beasts giving birth and suckling their young pups as the males bellow. The parking lot and the boardwalk at the vista point are overflowing with people who come from all over the world to check out the action. The elephant seals put on a fascinating show for the curious onlookers, who relish the opportunity to get up close and personal with the behemoth creatures. The job of the volunteer docents is to let people know just what's going on, and to keep everyone humans and animals alike safe. From the viewing area above the beach, it's easy to see what the elephant seals are doing on the sand, something like watching the Discovery Channel live with no TV screen. "One little boy asked me, 'Is this a zoo, or is this real?' I told him, 'This is life, and you're looking right at it,'" said docent Joan Crowder. She went through the special docent training offered by the Friends of the Elephant Seal in 2001, and has been doing weekly three-hour stints at the vista point bluff ever since. "It's really fun. You meet so many people, from so many different countries. Today, I talked to more than 100 people from all over the world Morocco, Iceland. They all want to know about the seals," said Crowder, who also writes a newsletter that docents hand out on the bluff. Around 90 people are currently serving as docents for the Friends of the Elephant Seal, according to the group's past president, Ann Grossman, who's now in her 10th year as a volunteer guide. "They're people who like the outdoors and who like to teach. They're proud of the Central Coast, and they want to share their knowledge," she said. The volunteers are happy to patiently answer questions, time and time again. One of the most frequent: "Why do the seals flip sand over themselves?" The answer: to keep cool in the sun. "We get all kinds of questions. Someone who was looking at the ocean asked what lake it is. Another visitor asked when the seals lay their eggs, but of course they're mammals and they give birth to live pups. Someone else, when he heard that the male seals go to Alaska to feed, asked how they get there. I joked that we load them up and take them to the airport. We often say we should write a book!" Grossman remarked. "It's a great program. Before the docents were here, people used to go down on the beach, put their kids on a seal to take a picture, and then wonder why they got bitten," said Charles Eads, who along with his mother Lynn completed the docent training in November. Preventing human harassment of the elephant seals may be contributing to their success as a local species. Today, the SLO County coast provides the birthing and breeding ground for around 14,000 of these remarkable creatures, with thousands more born here each December and January. "It's a fabulous show, seeing babies born before your eyes. It's just nature right in front of you," Grossman said. "Mating season is a big deal. Once there was this very graphic mating going on in front of us, and a girl about 11 asked me, 'Is this rated PG?'" Crowder said with a laugh. The setting for the docents' volunteer work is spectacular, with ocean waves crashing, and a full assortment of marine mammals to observe including spouting whales, occasional dolphins, California sea lions, sea otters, and harbor seals. The guides' characteristic blue windbreakers are often layered upon other warmer clothes or even raincoats, since the weather can be brisk or wet at times. The docents have also learned to endure the lack of a restroom on the site. Those who don't want to do vista-point duty can volunteer in the office or give presentations. "It's all about teaching people about nature. At this point, there's not a lot that's more important than that," Crowder concluded. Friends of the Elephant Seal holds training sessions for new docents in October, and accepts new members and donations any time. Contact the group at its office at the Cavalier Plaza in San Simeon (924-1628) or through its web site: www.elephantseal.org. Tickets are now on sale for the group's annual fundraising dinner-dance, set for March 24 at the Hearst warehouse in San Simeon.